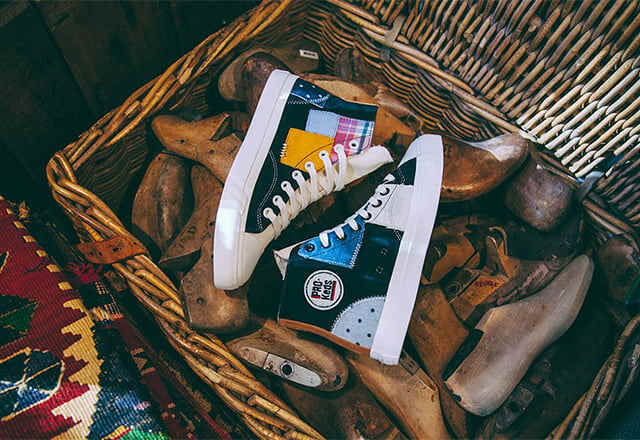 Footpatrol look to the famous fabric houses and haberdasheries of Soho for their latest collaboration with US sneaker brand PRO-Keds. As well as being known for the energetic vibrancy of the Berwick Street market and the cultural history of the encompassing record stores, Soho is also home to a vast array of stores that provide customers with materials and textiles. For this collaboration Footpatrol took to the various cloth houses around Soho to deliver a sneaker with unique bespoke-like features for the PRO-Ked Royal-Hi. Dubbed Patchwork, the black upper is produced in high quality wolverine suede and features cut-off patches from various fabrics like denim, wool, madras plaid, polka dot jacquard and unbleached duck canvas—which features Footpatrol’s iconic gas mask emblem. The ever-present PRO-Keds logo is featured on the inside ankle in the form of a chenille patch, while an oiled leather stripe logo sits on the heel. This is finished off with an off-white rubber toe cap and midsole that sits on top of a gum outsole. To celebrate the launch Footpatrol will be supplying in-store costumers with a free Ebbets Field Flannels ball cap with the chenille patched PRO-Keds logo on the front and 'Footpatrol' stitched on the back. Another inclusion in this free gift package is a limited edition Footpatrol x PRO-Keds pin badge courtesy of Pintrill. The Footpatrol x PRO-Keds Royal Hi Patchwork is out now from the Footpatrol store and webstore. Scroll down below for a closer look at the sneakers.